Swirls of gas on the surface of Jupiter. As unearthly as it may be, Jupiter shares a phenomenon with our own planet that you might find very familiar: lightning strikes. And lightning on Jupiter is somehow both more (and less) like the lightning on Earth than scientists previously thought. 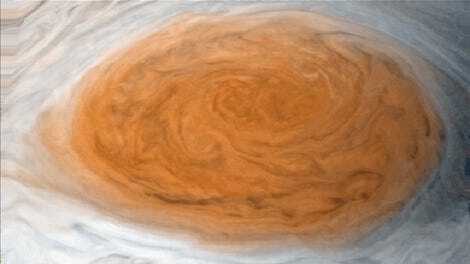 Every spacecraft to have visited Jupiter, as far back as Voyager in 1979, has spotted flashes of lightning. So it makes sense that the Juno orbiter, which arrived at the gas giant in 2016, would spot it, too. Some newly published results greatly expand our knowledge of these Jovian lightning strikes. “We succeeded in collecting the largest set of lightning detections known up to now,” study author Ivana Kolmašová from the Czech Academy of Sciences in Prague told Gizmodo. Voyager scientists first discovered lightning on Jupiter in the form of radio waves they generated called “whistlers.” When played as audio, they have a slowly descending whistling pitch that sounds like a bomb falling, distortions caused by their passing through the planet’s plasma. Voyage 1 image of Jupiter that seems to show lightning. But the whistlers aren’t the whole story. Visiting crafts should have also detected a higher-energy flash called a sferic, but they didn’t, making scientists wonder whether Jupiter’s lightning was in some way different from Earth’s. Scientists also wondered how frequently lightning struck and where it actually occurred. Two instruments on Juno, the Waves plasma and radio wave detector and the Microwave Radiometer, gave answers to both of these mysteries, while simultaneously posing new questions. The Waves instrument on Juno discovered six times more lightning than originally observed by Voyager, with much shorter-lasting whistlers, which probably has more to do with Juno’s differing orbit versus Voyager’s. There were up to four lightning strikes per second, very similar to rates here on Earth. The Microwave Radiometer spotted the high-energy sferics that other craft had been unable to detect. The researchers published the results in a pair of papers today, one in Nature and the other in Nature Astronomy. Previous missions like Voyager may have missed much of the lightning because they were orbiting the gas giant inside of the Io plasma torus, a noisy ring of electrically charged particles around Jupiter, said Bill Kurth, University of Iowa physicist who helped discover whistlers with Voyager. Kurth assisted in the analysis on the new results. What does all this mean? 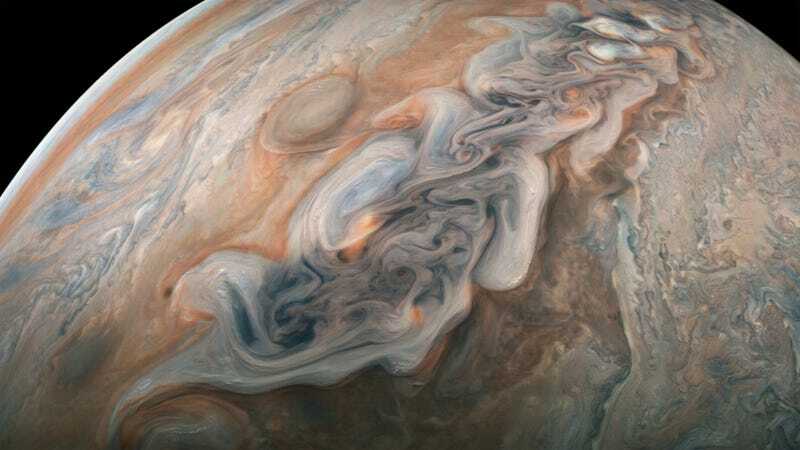 There are probably convective storms on Jupiter with water, similar to the thunderheads on Earth, but they demonstrate a different movement of that water than on our own planet. Thankfully the Juno mission will continue its work until at least the early 2020s, sending us more fascinating insights into our solar system’s largest planet. Fingers crossed, all of the probe’s equipment will continue working in the extreme Jovian environment.